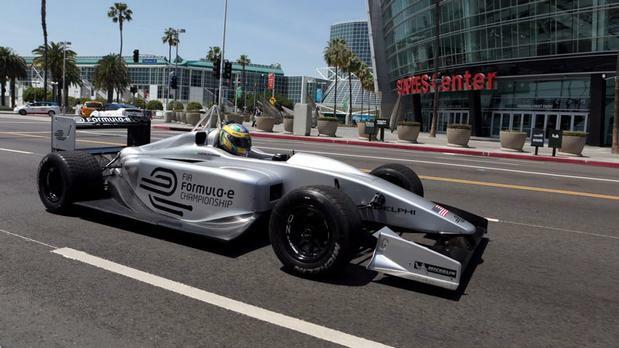 Lucas De Grassi drove an FIA Formula -E electric open wheel car in Los Angeles yesterday, on Earth Day. LA will be one of the ten cities to host Formula E races starting in 2014, all on temporary street circuits. Or that's the plan, so far the FIA has 8 dates in Rome, London, Miami, Pecking, Buenos Aires, Rio De Janeiro and Putrajaya with two other dates yet to be determined. The car weighs 780 kg (1720lbs) and have an equivalent of 400 hp. Being electric they make no sound beyond tire noise and maybe gear whine so the cars will be outfitted with a noisemaking gizmo said to produce and 80db "futuristic sound". The cars will be built by Spark Racing on a Dallara design with Mclaren electronic components. Races will be about an hour long but the cars have a battery range of about 25 minutes and no provision for quick change of their batteries meaning drivers will have to make a pit stop to change to a second charged car. There is a $2.6 M purse for the championship winning driver, $5.2M for the winning team. Don't know if this will take off. I was at WEC at silverstone a couple of weeks ago and hearing the noise of those cars screaming or thundering around was 70% of the attraction. I'm not sure how attractive silent racing will be, seem's like a PR stunt, might be better of as a support race for F1. The route that LPM1 have gone (massive kers and battery in the pit lane) and F1 is going next year seems a good compromise. Ironically, at the WEC at Silverstone the Audi LMP1's were the quietest cars, they kind of just glided around, the loudest were the Chevy GT's. Synthesized engine sound. Are the gear shifts also faked are does it have a proper gearbox, because if it did there would be no need for such close ratios. Honestly it might be interesting, but the whole change to a second car thing is ridiculous. How about changing battery packs? Sure it makes it harder to design but that is a part of racing - to build new tech. Same car start to finish or it's all a waste of time. Yeah instead of changing cars, which I agree is ridiculous, why don't they just make it a two sprint race feature or something similar? 25 minutes is pretty poor for battery life also. Maybe add more batteries and make the cars just a hair bigger? But watching drivers try to get out of one car and quickly into another will be comical at best. Seems rather dangerous as well. Switch cars? Can't hot swap batteries? What year is this again, 1980? Hot swapping batteries is a trivial matter.